Milwaukee, WI, USA; Milwaukee Bucks guard O.J. 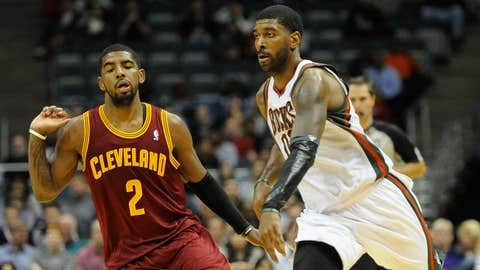 Mayo (00) drives past Cleveland Cavaliers guard Kyrie Irving (2) in the 3rd quarter at BMO Harris Bradley Center. Mayo had 28 points as the Bucks beat the Cavaliers 109-104. A rash of injuries has helped push the Chicago Bulls to the brink of their longest losing streak in four seasons. The visiting Cleveland Cavaliers haven’t had as many issues staying healthy lately, but it’s unclear if they’ll have Dion Waiters available for Saturday night’s visit to the United Center. Chicago (9-16) played its most recent game with Luol Deng out due to an ailing Achilles and Kirk Hinrich – the replacement for injured star point guard Derrick Rose – still dealing with a troublesome back. Jimmy Butler was also forced to leave Thursday’s 107-95 loss at Oklahoma City after hurting his right ankle. The statuses of all three players are unknown for the visit from Cleveland (10-15) and the Bulls’ attempt to avoid their first five-game skid since a string of 10 consecutive losses Feb. 27-March 19, 2010. "I think the challenge for us is not to accept what’s going on but to keep fighting," coach Tom Thibodeau said. "We’ve got to find some other people to step up." The Bulls have also dropped four straight at home – their longest skid there since a five-game slide March 1-19, 2010 – but have won six of their last seven at the United Center against Cleveland. The Cavaliers enter this game with a 2-11 road record, but Kyrie Irving has been one of the hottest scorers in the league of late, averaging 30.2 points in his last five games. Despite dealing with the flu, Irving had 39 points in a 114-111 overtime victory over Milwaukee on Friday, the Cavs’ sixth in nine games. Tristan Thompson provided the tying tip-in in the final seconds of regulation. "I just got to get through it," Irving said. "I’m just going to give it my all and live with the results." Waiters was a late scratch before the game because of tendinitis in his right wrist, and No. 1 overall draft pick Anthony Bennett sat out with an illness. Waiters is Cleveland’s second-leading scorer (14.9 points per game) and was averaging 20.7 points in his three previous contests. He had 25 on 11-of-19 shooting in a 119-116 loss to Portland on Tuesday. Jarrett Jack did his best to try to make up for Waiters absence Friday with 17 points, three shy of matching his season high, and five assists off the bench. "I thought Jarrett was big for us, especially with missing a guy like Dion (Waiters)," coach Mike Brown said. While they’ve struggled to win in most of their recent trips to Chicago, the Cavaliers have taken two of the last three overall meetings. They claimed a 97-93 victory in the latest of those matchups Nov. 30 as Waiters and Andrew Bynum scored 20 points apiece. Bynum also had 10 rebounds and five blocked shots in that win, but is averaging 6.0 points, 6.0 rebounds and 0.8 blocks in his last five games. Chicago had six players in double figures during the most recent matchup with Cleveland at the United Center, a 96-81 win Nov. 11, but Rose, Deng and Butler were among them. Deng’s absence would likely hurt the most Saturday as he’s averaging 21.2 points and shooting 53.4 percent in his last five games against the Cavaliers. Cleveland would likely feel the same about Waiters if he has to sit out. He’s averaged 19.3 points on 61.5 percent shooting in the past three games against Chicago. Irving, meanwhile, has struggled with his shooting in matchups with the Bulls, connecting at a 35.1 percent clip in five career meetings and averaging 15.6 points.